This morning, it was still storming with unfavorable weather reports along the route to Cordova. At 3:00 p.m. this afternoon, Lieutenant Harding, while releasing a small rope for the shackle bolt, unscrewed the bolt from the shackle, releasing the "New Orleans" form her moorings. The wind carried the plane rapidly towards shore, about 200 yards distant. His call for help was heeded by those on the launch anchored nearby, but due to the difficulty in getting the launch started and raising its anchor, Sergeant Ogden with one of the watchmen on the launch in a row boat responded to the "New Orleans" but could not hold it against the wind. In the meantime, Lieutenant Harding, working desperately, had removed the canvas cover over the engine cowling and the pilot's cockpit cover, primed the engine, and through good fortune it started when the plane was but a few feet from shore. He taxied back into position and it was made fast again to its moorings. Such circumstances as these kept all of us under a tremendous strain as to the safety of our planes, both day and night. At 6 o'clock last night, when the storm was raging, the "Boston" started dragging her anchor. 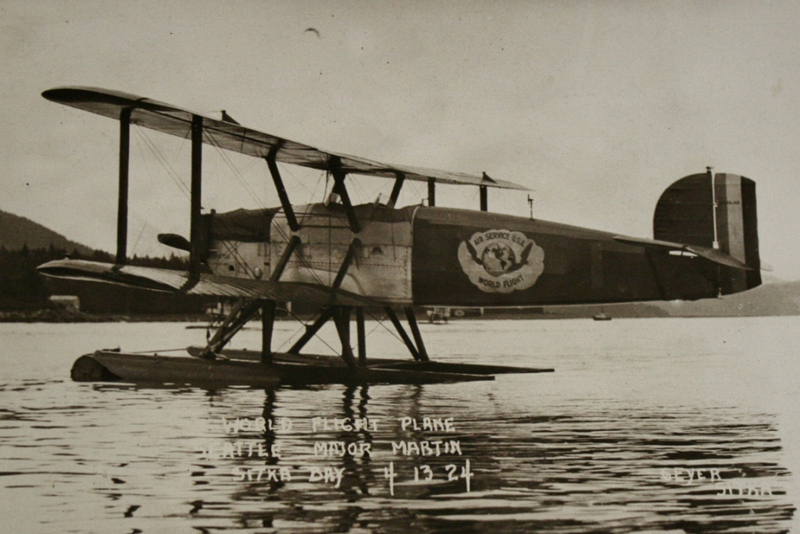 Everyone rushed to the rescue and with the assistance of the Forester of the United States Forestry Service which happened to be in Sitka, and a small launch which was engaged to stand by to protect the planes under such a contingency, she was held in place until additional anchors were obtained and made fast to each of the planes. This work was completed by 8:00 p.m.
Having had advance information that the weather would be bad this morning -- we slept until 6:00. Everyone went aboard to check pontoons, etc. & all planes rode out the storm exceptionally well. Squalls of hail & snow fell intermittently all day but the wind died down & the water gradually grew quieter. Everyone turned in for a nap during the afternoon & about 5:45 when Harding was making his evening check #4 slipped her mooring and started to drift ashore. There was much excitement for a few minutes until a boat got a line to the plane & Harding started up his motor & taxied back to his buoy. Tonight the weekly mail boat leaves, seems funny to us in the States. For there we ask what time does the mail leave, not what day. I still marvel at the scenery here, great mountains capped with snow & partly obscured with drifting fog & clouds; great flocks of gulls are always feeding on the beach & while a lot of them were scared away when we arrived most of them have returned now.